‘Never mind the polecats. . . let’s have more poodles!’. You could be mistaken for thinking that these are my words, the sentiments of a possessed proprietor of poodles, but you’d be barking up the wrong tree! No, this quote leapt out from the Springwatch message board and landed straight on my lap. It’s not that I have anything against polecats, although poles and cat suits are more to my liking, but the proof is in the pudding when it comes to picking between the two and poodles win paws down. So, enter, leaving behind a trail of the good outdoors all over the kitchen floor, Mr Itchy and Mr Scratchy! Not only do they take the biscuit, dark chocolate McVities digestive if you will, they take the popodoms, the pizza and it doesn’t stop there. . .they take over your pillow, your peace and, quite frankly, your life! But, I wouldn’t swap them for all the Earl Grey tea in China. Our universes collided some five and a half years ago when I first met the two black velvety wrigglers. Born to a Cruft’s pedigree miniature poodle mother, they cost a small fortune but years on and they are valueless to me! I may have forfeited some aspects of my masculinity for the pleasure of poodledom but I’m man enough to wear my poodles with pride! They too have had to let go of some of their male attributes, for the sake of peace between brothers, and dreadful as I felt about this I couldn’t resist immortalizing the pickled remains which are now sat, in all their glory, on top of a bookcase in the lounge. There’s no doubt that poodles are ‘different’. 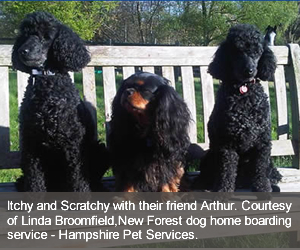 I was no virgin to the breed when Itchy and Scratchy came home with me as I had shared my life with poodles before. But, of course they are all highly individual and come with their own idiosyncratic idiocies and, thankfully, qualities too. Itchy is the more reserved of the two but tends to be the dominant animal, especially where food, toys and affection are concerned. He also has the better coat (sorry Scratchy! 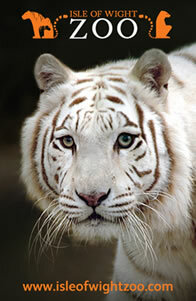 ), just that bit denser than his brother’s. Scratchy is the baby and the hunter and gets away with murder on both accounts; his black on white beady eyes bear into the deepest crevasses of your soul and do the trick every time. The boys are an integral part of my life in the New Forest. We are very much a pack and so social cohesion is important. I have to keep telling myself this when, awoken by the dawn chorus, the licking starts and goes on. . .and on . . . and on! Itchy first, Scratchy not far behind! Whatever the day brings, the boys bring more to it. I refer to them as my black fluffy parasites in the fondest way. These dogs need to be involved in my life and that’s the way I like it. What else? Well, both are outlaws. Both are the best. And both could cause me to bore you to death. They are my dogs and I love them for better and for worse but they are not your dogs so I don’t doubt you’re not really all that interested! In which case, what on earth are you doing reading this? Get out there and start praising polecats but remember….poodles rule! 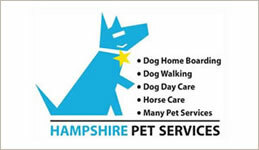 New Forest dog home boarding service – Hampshire Pet Services.